Hi! Thanks for the recipe. Please feel free to call me an idiot, but I just made these and mistook 1 tablespoon of yeast, sugar for a teaspoon. So yah, they didn’t turn out. Maybe consider a different font? It was really hard to read.
? yeah blame the font for not being able to tell a capital t from a lowercase ? I was also confused with the T. Every recipe I’ve used refers to teaspoon with tsp. And tablespoon with tbsp. Maybe it’s a western thing. Capital T. is always a tablespoon. Small t. Is a teaspoon. I love these! I’ve madetem at least ocean week since I found the recipe. Thanks! These are fast and fabulous. Instead of raising them in the oven I put the butter on the baking sheet and put it in to melt in a preheated oven 350.Then took it out and proceeded as directed. I let it raisefor about 10 minutes then baked it. Great idea of putting the dough right o to the pan and scoring it. I had company unexpectedly and had the breadsticks done start to finish in 40 min. Thank you! These are by far THE best breadsticks I have ever had. I didn’t have the specific garlic spread by used Italian seasoning and garlic salt. I also used mozzarella instead of Parmesan since it’s what I had on hand. SO soft, airy and BUTTERY! Amazing. So happy to hear you are enjoying this recipe! These are amazing!!! 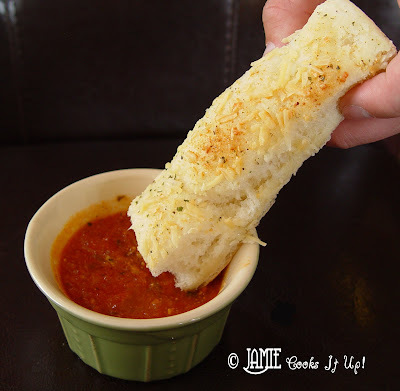 I found the recipe a few years ago and they are my go to breadsticks. Everyone loves them and I always get requests for the recipe. When using Kitchenaid mixer for this recipe, do you use the dough hook? Mix together, store in a shaker top closeable jar in the refrigerator!